This Remote Controlled, Submersible Light is perfect for centerpieces, fountains, ponds, ice sculptures, pools, and so much more. Turns on/off.... no flashing! 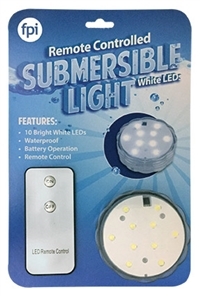 The waterproof light contains 10 LEDs that are bright, true white. Unit requires 3 AAA batteries (not included).